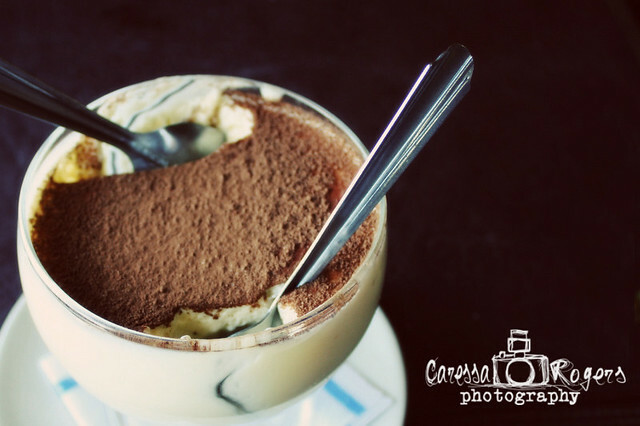 Caressa Rogers Photography: A Tiramisu to Remember! My love for Tiramisu began over two years ago in Rosario, Argentina. My best friend, Alli Gerard and I had taken a weekend trip to Rosario during our semester studying in Argentina. We had been site seeing all day and were famished. After an amazing meal of Pumpkin Ravioli we decided to treat ourselves to Tiramisu. It was my first taste of Tiramisu and I shall forever remember it! It had an incredible amount of the luscious cream filling and just enough of the lady fingers. The above picture is after we had taken our first bite. Since then whenever Alli and I are together and Tiramisu is an option on the menu there is no question we will finish our meal with it. Unfortunately, we have not yet met a Tiramisu that has beat that first experience in Argentina. Do you have a favorite food that is forever etched in your memory? I'd love to hear about it!